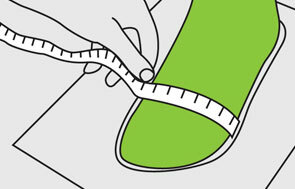 If you have problems choosing your size, or we have asked you to supply foot drawings to help with sizing, it’s easy. Simply follow the instructions here carefully and send us the original drawings on thin white paper with your name, contact details and style you fancy. We will then contact you to discuss your fitting. If you take are a standard size in most High Street shops just order your normal size. Please remember, you will need to ask a friend to do the drawings for you. It is not possible to do them accurately yourself and could cause your shoes to be made to small or too big. Supplying us with profiles of your feet doesn’t necessarily mean you need a modified fit, it may be that you aren’t sure if you have narrow, standard or wide feet or we just need to get more details of your feet to enable us to size you. We can also modify our patterns to accommodate minor alterations, giving you a little extra ‘here and there’ where you need it. We offer this modified fit service for £35.00 – £125 (price depends on the modification needed) over the price of a standard size. Cost £235 over the price of standard size or £125 if we have patterns already made for you. We are not offering our full made to measure service at this time unless you have had shoes from us before. If you are unsure whether you are a modified fit or a full made to measure you are welcome to come for a fitting but please note you may be told that we are unable to make shoes for you at this time.